SCVHistory.com LW3307 | Placerita Canyon | Bob Steele, Janis Elliott in 'South of Santa Fe' (Trem Carr 1932). Bob Steele and Janis Elliott star in 1932's "South of Santa Fe" from Trem Carr Productions. 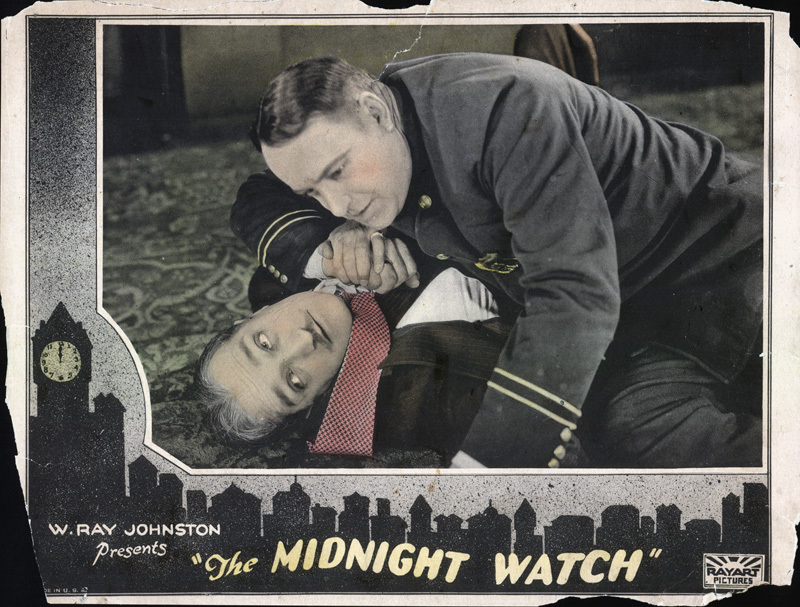 Lobby card, 11x14 inches. At the time this picture was made, Carr was leasing property in Placerita Canyon just east of today's 14 Freeway which would (much later) become Disney's Golden Oak Ranch. In 1936, Carr and partner Ernie Hickson moved their Western movie town westerly down Placerita Canyon Road to a location that would (much later) become Gene Autry's Melody Ranch. Bert Glennon directed the studio work on this picture. Directing the location work in Placerita Canyon was Paul Malvern, who made movies of his own in the canyon under the Lone Star label, with Bob Steele (real name Bob Bradbury) and Bradbury's high school buddy Marion Morrison aka John Wayne in the starring roles (not in the same picture). Hickson was in charge of set decoration here, but his role was more than that: He ran the prop house at Carr's movie ranch (he owned the props) and even built its Western buildings (he owned the buildings). This 1932 verson of "South of Santa Fe" shouldn't be confused with two other versions with the same title and their own SCV connections — a 1942 version with Roy Rogers that also was filmed in Placerita Canyon, and a 1949 version with eventual Newhall resident Tex Williams. As we're dealing with a Trem Carr picture, the cinematographer is Archie Stout. Rounding out the credited cast are Ed Brady, Eddie Dunn, Al Bridge, Gordon De Main, Chris-Pin Martin, John Elliott, Al Ernest Garcia and Hank Bell. Uncredted cast includes Bob Burns, Jack Evans, Al Haskell, Perry Murdock, Archie Ricks, F.R. Smith, Slim Whitaker and Bob Steele's steed, Boy the Horse. LW3307: 9600 dpi jpeg from original lobby card purchased 2018 by Leon Worden.